So... what do you think? I decided to go for girly and fun instead of my usual "floral or nature" themes that I love so much. The set is called Wonder and Joy. I can honestly say, this was definitely out of my comfort zone. I can't wait to get the rest of the cards from the swap. 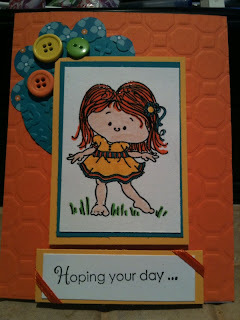 I am hostessing this swap on SplitCoastStampers. I will post the rest of them when they come in. Oh yeah... slowly getting some stamping done.